This summer, my family and I visited the beach. That’s a pretty big deal for this Midwestern girl. I can probably count on two hands the times I’ve seen the ocean up close and personal. Well, in my 40s one would hope it would have been different. I’ve heard it said, and I believe it to be true, that after 40 you really don’t care what others think. Sure, I’d like to look like Cindy Crawford, but that ain’t gonna happen. I’ve stopped holding on to the dream. I have finally found comfort in my own skin and come to grips with my own physique…cue the victory parade! But now I faced a new obstacle: scars. My first surgery in 2010 left me with a 6-inch scar running down the back of my left thigh. Of course I know it’s there, but since it’s on the back of my leg and it’s faded over the last few years, it’s easy to forget about. This time, however, there was a new scar, and this one wasn’t so easy to hide…my port. For those who don’t know, a port is a small device implanted just under the skin for the purpose of delivering chemotherapy drugs. While I am thankful to have had it during chemo, I wasn’t looking forward to toting it along on my vacation. It’s implanted right under my right collar bone, so it was easy to cover up with clothing through the long, cold winter. But now it was swim suit season. That was a whole new ball game. Unlike the one on the back of my leg, this was one scar I could not ignore. When someone looked at my face, there it was…a few inches below my chin, looking like it was about to burst out from under my skin. It was unmistakable. It was unavoidable. That is when I decided…it would just have to be seen, and I (and everyone at Ft. Walton Beach) would just have to live with it! Strangely enough, it didn’t bother me once my feet hit the sand. 🙂 I figured those who didn’t know what it was could probably care less. And those who did know what it was…well, they would understand. They would know that it’s more than an ugly protrusion under my skin. It’s a physical marker of the battle I am waging. A weapon in my arsenal. 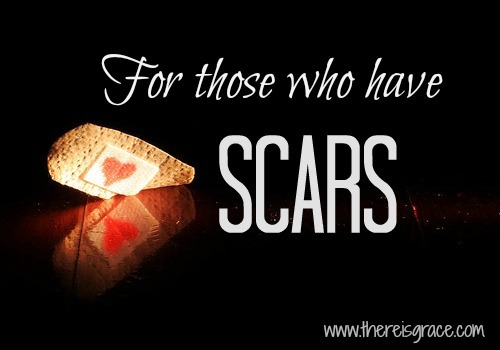 That’s the thing about scars…those of us who have them understand what they represent. We don’t see the ugly or the imperfection. We see the struggle. The fight. The victory. As I type this, I am recovering from yet another surgery, and I have yet another scar. Before all is said and done, I’ll likely have two more. I don’t like scars. Not because they’re ugly, but because they represent pain. Deep pain. Pain no one should have to endure. They remind us of a time when we were weak, vulnerable. Pray you are doing well since your last surgery. This is so powerful and will minister to so many…including me! Just got goosebumps reading this, my friend. Very well said!